Cruise Amsterdams canals. See castles on the Rhine. Behold the grandeur of Vienna. Celebrate folk traditions in Hungary, Croatia, Serbia, Bulgaria and Romania. These travel iconsand moreawait you on a 23-day journey combining our Grand European Tour and Passage to Eastern Europe cruises. Discover eight countries in Western, Central and Eastern Europe while cruising the Rhine, Main and Danube. Enjoy a lifetimes worth of experiences on a single voyage of unparalleled enrichment. On a breathtaking stretch of the Rhine that leads from medieval Koblenz to Braubach to R¼desheim, the 11th-century Marksburg Castle towers over the river. Lively and romantic, the medieval town of Miltenberg on the Main River lies amid one of Germanys fine wineproducing regions. W¼rzburg is home to the Bishops Residenz, one of Germanys largest and most ornate palaces and a UNESCO World Heritage Site. 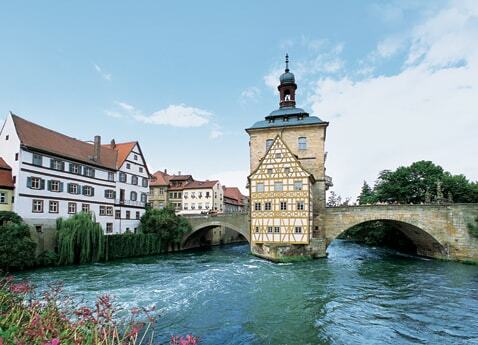 Founded in 902, Bamberg remains a medieval-looking city known for its symphony orchestra and specialty, smoke beer. One of Germanys most renowned and intriguing cities, Nuremberg is surrounded by 13th-century walls that have many fully intact gates and watchtowers. Having escaped major damage during World War II, the picturesque town of Regensburg is one of Europes best preserved medieval cities and the oldest city along the Danube. Strauss and Mozart composed many fine pieces in Vienna, Europes center of classical music. Budapest is aptly called Paris of the East for its beautiful evening illumination and reflected lights in the Danubes waters. Osijek is the largest city and the economic and cultural capital of the eastern Croatian region of Slavonia. Today, sail through one of Europes most dramatic natural wonders, the picturesque stretch famously known as the Iron Gate. Often referred to as the “City of the Tsars”, Veliko Tarnovo is located on the Yantra River. Bucharest is Romanias cultural capital. Its original fortress, the first of many, was built to protect the Walachian state from the Turks.